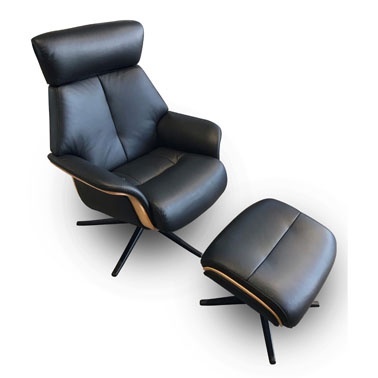 Space 57.57 recliner and footstool by IMG of Norway in Trend Tuxedo leather with oak and matte black metal star base. Space is built for look and comfort and is a masterpiece in luxury seating that will give you years of absolute comfort. The back angle is adjustable with an unique gas-lift system to adapt to all comfort requirements. With all the built-in functions in this recliner, you will experience an entirely different level of absolute comfort.